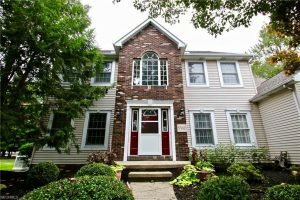 An abundance of amenities are included with this beautiful home right in the heart of Mentor! You are greeted in a private setting on a cul-de-sac secluded with trees, a 3 and a half car garage as well as a large deck off the back of the home. Upon entering the home you will notice a great amount of space yet you do not feel lost in the size. The current room being used as an office on the main floor can easily have a closet added for main floor living. There is also a full bath and laundry on the 1st level. Your formal dining, eat in kitchen and magnificent great room with a gas fireplace finish off the main level. The custom window treatments you will notice throughout will be included with the home as some are also built in. Two more large bedrooms are upstairs in addition to a full bath, the master suite, master bath and over sized master bedroom closet / bonus room. Back down to the lower level you will be further surprised to find recessed lights throughout the expansive rec room, Bose surround sound, another gas fireplace, a kitchenette, another full bathroom and a storage room.